This 2018 QX80 Tech Package demo is equipped with a TAG anti-theft tracking device, a front hood and bumper protection (Protex), winter mats, tinted windows and winter tires on original mags. 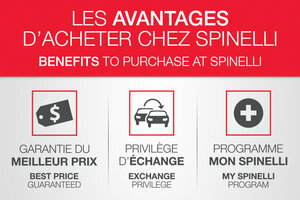 For more information, please contact the Spinelli Infiniti sales departement at (514) 697-5222. Let us impress you with a unique and personalized service, a clear and transparent transaction and an independent purchase offer on your Trade-in. Also open on Saturdays, Spinelli Infiniti is located in Pointe-Claire in front of the Fairview shopping center, only 10 minutes from Montreal and Vaudreuil. * Indicated mileage may vary. * Indicated price includes cash purchase incentives. Cylinders : 8 Cylinder Engine 5.6L - 8 cyl.